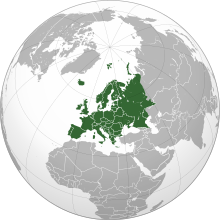 Europe is a continent that comprises the westernmost part of Eurasia. Europe is bordered by the Arctic Ocean to the north, the Atlantic Ocean to the west, and the Mediterranean Sea to the south. To the east and southeast, Europe is generally considered as separated from Asia by the watershed divides of the Ural and Caucasus Mountains, the Ural River, the Caspian and Black Seas, and the waterways of the Turkish Straits. Europe, in particular ancient Greece, was the birthplace of Western civilization. The fall of the Western Roman Empire, during the migration period, marked the end of ancient history and the beginning of an era known as the Middle Ages. Renaissance, humanism, exploration, art, and science led to the modern era. From the Age of Discovery onwards, Europe played a predominant role in global affairs. Between the 16th and 20th centuries, European powers controlled at various times the Americas, most of Africa, Oceania, and the majority of Asia. The USA will remain the only superpower. China is becoming an economic giant. Europe is being Islamicized. [T]he escalation of the radicalization of Muslims in Europe, I think, has, in the past 2 or 3 years – and you know the incidents – the Nice truck bombing, the Berlin Christmas Fair bombing, those sorts of incidents, I think, have really worried Europeans... The thing I worry about in Europe is that there is a logic of escalation in some of this. That the people whose voices aren’t heard have to do things to make their voices heard. Do you know what I mean? They’ll have to, you know, like, demonstrate and that kind of thing... Europe can be the scene of world history even if it’s not the protagonist in world history, but it seems to show very little sign of being the protagonist. Albert Camus, "Create Dangerously," lecture given at the University of Uppsala, Sweden (December 1957); republished by Camus in Resistance, Rebellion and Death (1961), Justin O'Brien, translator, p. 270. Soon nostalgia will be another name for Europe. Many of the traits on which modern Europe prides itself came to it from Muslim Spain. Diplomacy, free trade, open borders, the techniques of academic research, of anthropology, etiquette, fashion, various types of medicine, hospitals, all came from this great city of cities. (...) The surprise is the extent to which Islam has been a part of Europe for so long, first in Spain, then in the Balkans, and the extent to which it has contributed so much towards the civilisation which we all too often think of, wrongly, as entirely Western. Islam is part of our past and our present, in all fields of human endeavour. It has helped to create modern Europe. It is part of our own inheritance, not a thing apart. It was the fate of Europe to be always a battleground. Differences in race, in religion, in political genius and social ideals, seemed always... to be invitations to contest by battle. Europe tears itself apart in moral confusion and historical guilt. As to the territorial limits of Europe, they may seem relatively clear on its seaward flanks, but many island groups far to the north and west—Svalbard, the Faroes, Iceland, and the Madeira and Canary islands—are considered European, while Greenland (though tied politically to Denmark) is conventionally allocated to North America. Furthermore, the Mediterranean coastlands of North Africa and southwestern Asia also exhibit some European physical and cultural affinities. Turkey and Cyprus in particular, while geologically Asian, possess elements of European culture and may be regarded as parts of Europe. Europe dominated the world, but it failed to dominate itself. For five hundred years Europe tore itself apart in civil wars. Contemporary Europe is a search for an exit from hell... Europe has always been a bloody place. No continent is as small and fragmented as Europe. Only Australia is smaller, yet Europe consists of fifty independent nations (including Turkey and the Caucasus, for reasons explained later). Crowded with nations, it is also crowded with people. Europe's population density is 72.5 people per square kilometer. The European Union's density is 112 people per square kilometer. Asia has 86 people per square kilometer. Europe is crowded and fragmented. Oui, c'est l'Europe, depuis l'Atlantique jusqu'à l'Oural, c'est l'Europe, c'est toute l'Europe, qui décidera du destin du monde! Translation: Yes, it is Europe, from the Atlantic to the Urals, it is Europe, it is the whole of Europe, that will decide the fate of the world. Charles de Gaulle, 23 November 1959, Strasbourg. The peoples of Europe are a work in progress and always must be... The history of the people of Europe has not ended -- it never will. Ethnogenesis is a process of the present and future as much as it is the past. No efforts of romantics, politicians, or social scientists can preserve once and for all some essential soul of a people or nation. Nor can any effort ensure that nations, ethnic groups, and communities of today will not vanish utterly in the future. The past may have set the parameters within which one can build the future, but it cannot determine what that future must be. Europe is not really even a geographic entity; it is separated from Asia only at one point, the Bosphorus, by a small stretch of water. North of that there is continuity over the russians steppes, a complete terrestrial flow. I suggest that is also true of culture, and indeed of social organization. Indeed Europe has never been purely isolated, purely Christian. Instead of Christian Europe, one has to see the continent as penetrated by the three world religions that originated in the Near East and which indeed had a common mythology or sacred text; in order of arrival these were Judaism, Christianity and Islam. (...) All have equal entitlements to be present, and in this general ('objective') sense none can be considered only as the Other; they are part of Europe, part of our heritage. Europe. Their political interests are entirely distinct from ours. Their mutual jealousies, their balance of power, their complicated alliances, their forms and principles of government, are all foreign to us. They are nations of eternal war. All their energies are expended in the destruction of the labor, property and lives of their people. When we get piled upon one another in large cities, as in Europe, we shall become corrupt as in Europe, and go to eating one another as they do there. Thomas Jefferson, letter to James Madison (20 December 1787), The Writings of Thomas Jefferson (19 Vols., 1905) edited by Andrew A. Lipscomb and Albert Ellery Bergh, Vol. VI, p. 392. [Y]ou don’t have to talk about Nazis or Hitler or any of that to say the norm in Europe is competition, conflict. And if we think that that’s over, I think that history tells us otherwise. In Europe, there exist no borders. The people I spoke to all agreed that their quality of life was enhanced in many ways after unification of the continent. We saw the amazing synergy effects of European union. Europe’s political stability, social cohesion, economic prosperity and security are more threatened today than at any point since the Cold War, Russia is destabilizing the Continent on every front. Indigenous factors – whether long-extant nationalism, design flaws in the Eurozone lack of a common foreign policy, or incapability at assimilating immigrants – certainly lie at the root of these crises. There is no place for concern that it would change the structure and operation of the EU in a radical way. 90% of the constitution agreement is already in the current agreements. The innovations in the draft will clarify the structure of the EU and make its activity more efficient, as well as strengthen citizens’ rights. I'm worried about moving in the direction of Western Europe, because I believe that the higher taxes in Western Europe are one of the reasons that those economies aren't as rich as we are and why people don't work as much in Western Europe as they do in the United States. What has made the European family of nations an improving, instead of a stationary portion of mankind? Not any superior excellence in them, which, when it exists, exists as the effect, not as the cause; but their remarkable diversity of character and culture. Individuals, classes, nations, have been extremely unlike one another: they have struck out a great variety of paths, each leading to something valuable; and although at every period those who travelled in different paths have been intolerant of one another, and each would have thought it an excellent thing if all the rest could have been compelled to travel his road, their attempts to thwart each other's development have rarely had any permanent success, and each has in time endured to receive the good which the others have offered. Europe is, in my judgment, wholly indebted to this plurality of paths for its progressive and many-sided development. [I]n Europe, faced with the choice between human rights and gas, many politicians pick gas. People often think that Europeans are homogeneous group that arrived in a simple way there maybe 40 or 50 thousand years ago maybe based on the archaeology and just kind of sat there until they became the Europeans they are today, but that's probably not true: the Europeans today are a replacement population who came in much more recently and replaced the people who were there originally 40 thousand years ago. Europe owes its greatness to the fact that the primary loyalties of the European people have been detached from religion and re-attached to the land. Those who believe that the division of Europe into nations has been the primary cause of European wars should remember the devastating wars of religion that national loyalties finally brought to an end. And they should study our art and literature for its inner meaning. In almost every case, they will discover, it is an art and literature not of war but of peace, an invocation of home and the routines of home, of gentleness, everydayness and enduring settlement... The idea that the citizen owes loyalty to a country, a territory, a jurisdiction and all those who reside within it — the root assumption of democratic politics, and one that depends upon the nation as its moral foundation - that idea has no place in the minds and hearts of many who now call themselves citizens of European states. Europeans believe that people from other cultures are threatening their national identities and livelihoods... Europe is rediscovering nationalism... Europeans have long defined themselves by a strong sentiment of national belonging, often linked to language, ethnicity and religion, and distrust of foreigners. The love for the place you were born, the trust of the people who surround you, and the fear of what strangers could do to you and your community is a basic human feeling. But in Europe, nationalism is particularly notable for the sheer scale of death and destruction it historically has brought. I would rather visit Latin America or the Middle East than Europe. The people – especially Arabs and Kurds – are more pleasant to be around. Europe is and will be a Union of States. I am a citizen of the greatest Republic of Mankind. I see the human race united like a huge family by brotherly ties. We have made a sowing of liberty which will, little by little, spring up across the whole world. One day, on the model of the United States of America, a United States of Europe will come into being. The United States will legislate for all its nationalities. Washington wrote to Lafayette that he considered himself a "citizen of the great republic of humanity," adding: "I see the human race a great family, united by fraternal bonds." Elsewhere he wrote prophetically: "We have sown a seed of liberty and union that will gradually germinate throughout the earth. Some day, on the model of the United States of America, will be constituted the United States of Europe." Altho' I pretend to no peculiar information respecting commercial affairs, nor any foresight into the scenes of futurity; yet as the member of an infant empire, as a Philanthropist by character, and (if I may be allowed the expression) as a Citizen of the great republic of humanity at large; I cannot help turning my attention sometimes to this subject. I would be understood to mean, I cannot avoid reflecting with pleasure on the probable influence that commerce may hereafter have on human manners and society in general. On these occasions I consider how mankind may be connected like one great family in fraternal ties. I indulge a fond, perhaps an enthusiastic idea, that as the world is evidently much less barbarous than it has been, its melioration must still be progressive; that nations are becoming more humanized in their policy, that the subjects of ambition and causes for hostility are daily diminishing, and, in fine, that the period is not very remote, when the benefits of a liberal and free commerce will, pretty generally, succeed to the devastations and horrors of war.